From November 2014 until May 2015, I was one of four “Makers in Residence” at Derby Silk Mill Museum. We were a mix of artists, creatives and engineers. This proved an interesting melting pot of ideas and a number of us working together on our ideas and projects. This has been a slight change of activity for me, as I usually focus on renewable energy systems, but has been a great opportunity to encourage Science, Technology, Engineering, Art and Mathematics (STEAM). I hoped to encourage the younger folk (and all ages!) to get involved with future engineering and technology issues. The residency had a very open brief, but the main aim was to engage visitors within the museum to the ideas of STEAM: Science, Technology, Engineering, Art and Mathematics. Derby Silk Mill is the ‘Museum of Making’ and has recently won major funding. Derby has a long history of metal casting and the museum has a huge collection of cast iron railway signs. I wanted to do a hands-on workshop which showed the process of metal casting, but that was slightly more child friendly. I developed a kit of part for making small keyrings (of the Silk Mill Building) using Polymorph, a low melting point plastic. 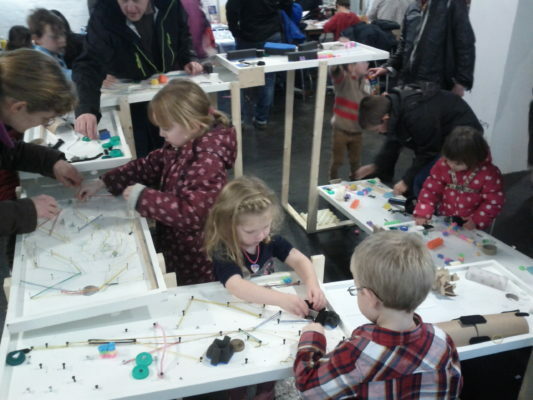 One of the activities I have been running at Derby Mini Maker Faire each year has been the hugely popular DIY marble run. This is a simple marble run with planks of wood that slope gently downwards. 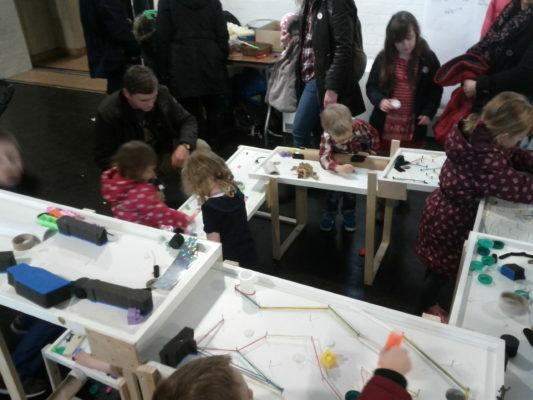 People of all ages can then add or remove recycled materials to change the path of marbles as they run down the track. I wanted to improve this unit, making it easier to use, easier to store and brand it for the Silk Mill. Using the amazing facilities at the Silk Mill, I created an interesting hexagonal shaped unit, which can be stored in quite a small space. There are 6 levels for different ages to work at and the surface layer of the unit can easily be replaced when it is worn out. This is the unit packed away – each section fits into each other. The final activity I worked on was a simple robot base with an Arduino controller. This was designed for use with the Code Club sessions which are being run at the Silk Mill.